The first mention of the N.I.R.D. was in the 'Reading Mercury' of November 15th 1919, in a long article on 'The Research Institute in Dairying at Reading – Its Present Opportunity'. The following article came at the at the other end of the N.I.R.D. 's existence, and is an extract from the N.I.R.D. Final report, 1984/5. The need for farm land at agricultural research institutes is sometimes questioned. At the N.I.R.D. 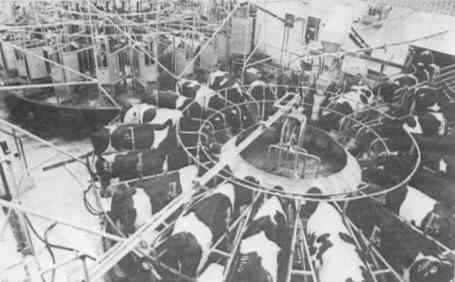 (National Institute for Research in Dairying) it would have been possible to carry out research on the physiology of lactation and ruminant nutrition with small numbers of cows and relatively little land, but for a substantial programme of applied research on milk production technology, large numbers of cattle at the calf, rearing and lactation stages are essential. The move from Reading to Shinfield in 1920 provided the Institute with Church Farm. This comprised 332 acres and some traditional buildings which, with some inexpensive additions, allowed the development of a Shorthorn herd of up to 60 cows. The need for expansion of the farming activities became evident during the 1930's. In 1945 land was relatively inexpensive and was coming on the market locally. The first purchase was Arborfield Hall Farm in 1947 (299 acres) and although this subsequently became the home of the Bernard Weitz Centre with a new herd of 400 lactating cows, it was originally bought to provide extra sources of home-grown forage crops and to give grazing and housing for young stock. The farm is mainly situated on Valley Gravel interspersed with London Clay and at the time of purchase was in a low state of fertility. There were also signs of land drainage problems. A modest programme of drain laying coupled with the repair of Sir John Conroy's land drainage system laid a century earlier enabled most of the land to be ploughed and a cropping system developed. It was found possible to build up fertility with lucerne and this, together with subsequent introduction of forage maize, not only increased greatly forage supply in the form of hay, silages and later dried lucerne but also permitted the growing of good crops of barley. Some of Conroy's old buildings have been adapted for cattle housing and part of the scrub land was cleared for cropping, but most of the woodland, particularly that bordering the River Loddon and the other boundaries of the farm, has been retained and there is an annual programme of tree planting. Although the new cattle buildings are utilitarian rather than beautiful, visitors to Arborfield Hall Farm still appreciate its amenity value. At the time of purchase of Hall Farm the Institute also took over the tenancy of about 73 acres of land between the River Loddon and the village of Shinfield. This land was subsequently purchased by the University of Reading. It provided for increased silage production and was particularly useful for summer grazing since it is low lying and some of it is more drought resistant than the land on the Arborfield side of the Loddon. It was also convenient for irrigation from the River Loddon. After the purchase of Hall Farm, Arborfield, there still existed a small farm, Parrot Farm, between the village of Shinfield and the River Loddon which was completely surrounded by Church Farm, Shinfield, and Hall Farm, Arborfield. It was not particularly good land and a substantial part of it was at that time subject to regular flooding from the river. Its potential value to the Institute was, however, great since it was an obvious corridor between Church Farm and Hall Farm. Mr. Smith, the owner of Parrot Farm, and his brother decided to give up farming and to sell their farm. It consisted of 141 acres and was bought by the Institute in 1961. Carters Hill Farm of 268 acres was bought in 1971. 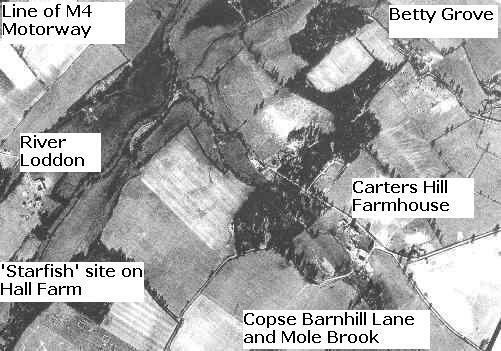 One main reason for acquiring this additional land was that the Institute's work on the feeding of dairy cattle and also on the mechanics of dairy farming would be much more effective if a larger up-to-date dairy cattle unit was deve loped and since this unit would require more land, its siting at Arborfield with easy access to the Carters Hill land was appropriate. In the event, the developmenttt of the Bernard Weitz Centre at Arborfield, close to the Carters Hill boundary, was dependent on the Carters Hill land. The land at Carters Hill is mostly situated on Valley Gravel with a relatively small area of riverside alluvium and as at Arborfield and Shinfield good crops of maize and lucerne have been produced. With the purchase of Carters Hill the Institute were farming 1113 acres. As land was purchased estate work was necessary. The gravel tracks through Arborfield Hall farm were replaced with concrete roads but the main costs were those of land drainage and fencing. The former was made possible by cooperation with Thames Conservancy in clearing some of the traditional watercourses to the Loddon and although some land is flooded in very wet weather the flood water normally clears in 3 or 4 days without apparent damage. Most of Arborfield Hall Farm had been tile drained by Sir John Conroy in 1840-1850 and some of his drains still operate but others had to be replaced or supported with new drainage systems. The Institute will cease to exist on 31st March, 1985. The value of the N.I.R.D. farm for research and indeed in financial terms has been greatly increased since the last war. Most of those who were concerned with it will hope that the farms and facilities which they carefully developed will find a use for which they were indeed intended whilst still retaining their public amenity value. It would be sad, indeed, if this long strand of pleasant agricultural land following the River Loddon were allowed to deteriorate into haphazard redevelopment. Church Farm in Shinfield has now been developed for housing, while the facilities at Arborfield Hall became known as 'CEDAR' - the Centre for Dairy Research. Aerial photographs by permission of National Monuments Record, English Heritage.